BioNutria Park formerly known as AutoC Park Randers is a purpose built football stadium located in the north-eastern Danish city of Randers. 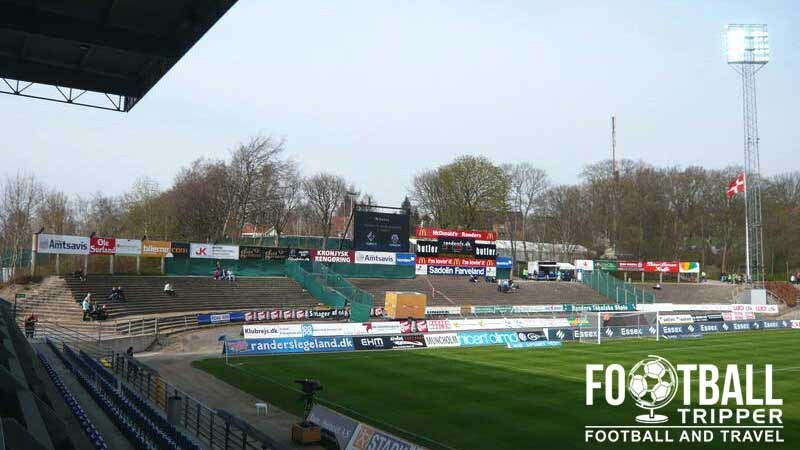 Home to the local team Randers FC which takes its name from the city, the ground has a current capacity of 10,300 and was recently renovated in 2012 to give it its current look. The use of the land on which today’s AutoC Park currently sits at has been used to host football matches since at least 1961, when Randers FC constructed the first iteration of their home stadium. Exactly 45 years after first opening, the club decided to demolish and completely rebuild the majority of their 20th century ground after it was becoming increasingly dated and expensive to maintain. Designed by C. F. Møller Architects who were one of fifteen firms who collaborated on the design of the Olympic Village for the 2012 Olympics in London, the new Randers Stadium was constructed during the 2005-2006 season with the North Stand being the only section of the old ground not to be replaced, although it eventually would be six years later in 2012. The newly constructed stadium has an official capacity of 10,300 which consists of 9,000 seats and 1,300 terrace places although unofficially it is believed that the ground can safely accommodate up to 13,500 fans. 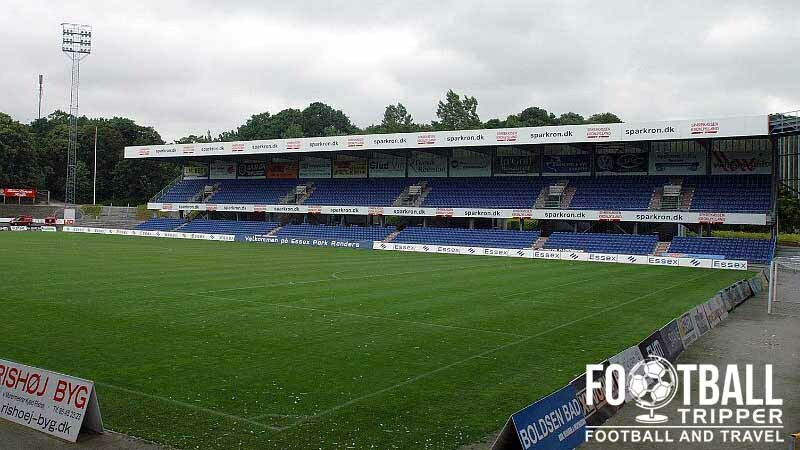 The record attendance since 2006 was set on the 16th May when 11,824 fans attended the match against Brøndby IF, although with the old stadium the record stands at 17,200 for an international match. 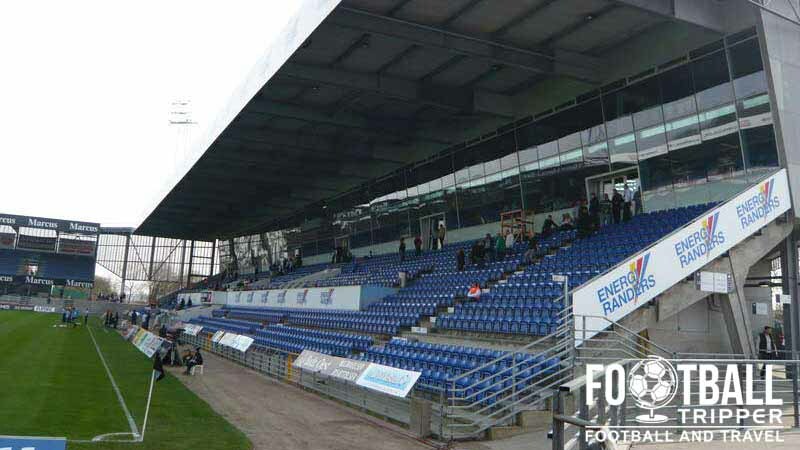 The ground has historically being known as Randers Stadion but since the remodelling, the naming rights have been sold to two different companies, initially becoming the Essex Park Randers after the Danish real estate company. After that deal expired, was known as AutoC Park Randers Stadion for a while and now BioNutria Park. Randers Stadion is comprised of four stands: North, East, South and West. Away fans are housed within the south-west corner within the two purple sections Udehold and Nybolig which are capable of accommodating up to 800 visiting supporters per match. 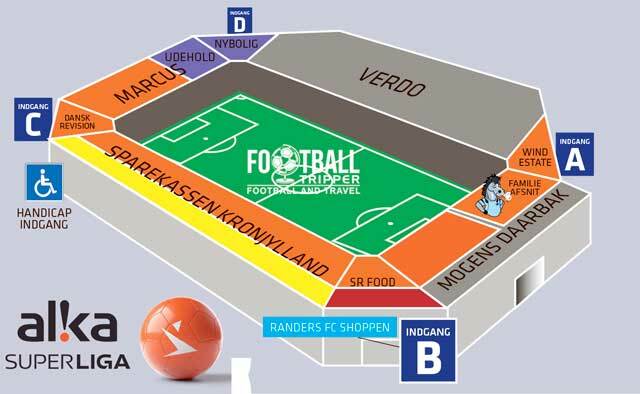 The entrance to the away section is granted through Indgang (gate) D.
Unfortunately it doesn’t appear as if Randers FC operate a full time club shop at the stadium which means you can only really browse the online store and physically pick-up souvenirs on matchdays. Alternatively you could try and visit one of three Intersport shops which can be found around the city. They’re known to stock a small range of Randers goods. 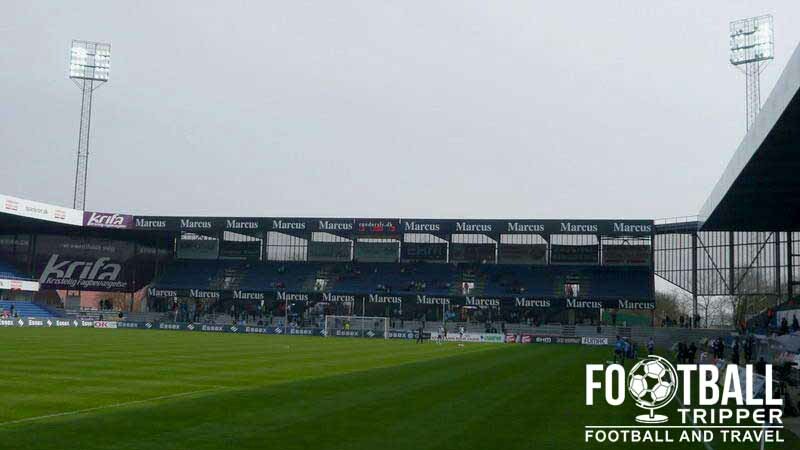 It doesn’t seem as if there are any fan tours available of the facilities at Randers Stadion. Should this ever change we’ll be sure to update this section. Tickets to see Randers FC In action can be purchased in one of three ways: online from the official website, from the club shop during the week and from the ticket booths around the ground on matchdays. Please note that for Category A matches ticket prices increase by around 20-30 kr in order to offset demand. Typically there are only 2-3 Category A matches a season, usually against Brondby and Copenhagen. Randers Stadium is located approximately 2.0 km west of St Martens Church, and Randers city centre which is loosely marked by the u-shaped ring road. For those Football Trippers who are planning on walking to the ground you’re looking at a journey of no more than 25 minutes. There are at least five car parks at the ground with the largest of the bunch located to the west of the ground just off of Viborgvej. Untarmacked, parking here operates on a first-come first-served basis. The distance from Randers Railway Station is exactly 1 kilometre which means you’d be looking at a stroll of around 10 minutes which is good to know if you’re coming from out of town. Randers Train Station forms part of the Aarhus-Aalborg Line, and you can catch InterCity services to Copenhagen which depart daily. Along Viborgvej south of the stadium there is a dedicated stadion bus stop which is served by bus numbers 10 and 11. The two closest major airports to Randers are Aarhus (45 km) and Karup (75 km). If you’re travelling from outside of Denmark you may have to transfer at Copenhagen Airport which is 230 km away to the south-east. The most conveniently placed hotel at a glance appears to be the Best Western just outside the station, however the location comes at a premium which many aren’t willing to pay – myself included. Within the ring-roaded central area you will find Hotel Randers and Stephansens Hotel which are much more affordable accommodation options.